The Wales Coast Path attracted nearly three million visitors and brought £32m to the economy over 12 months, figures suggest. Tourism bosses said it had added "another dimension" to the attraction of walking in Wales. The coastal path stretches 870 miles (1,400km) from the River Dee in Flintshire to Chepstow in the south. Work on the path, the world's first round an entire country, began in 2007 with the formal opening in May 2012. Landlady Elizabeth Williams says the path has had a "dramatic effect" on business. She said: "It's possible that we may have had to close the business without it. "With the pub being so close to the beach, it's very weather dependent. "Casual walkers are more resilient - if you get a cold day with drizzle, they will still come out and walk. "It has enabled us to take on an apprentice chef and a part-timer from the village." Bridgend had the greatest number of visitors at 666,000 followed by Flintshire at 419,000. The overwhelming majority of the visits (94%) were walking for leisure, with 38% of them using it as part of a longer holiday. Cyclists made up 4% of people using the path. Carole Startin, of Tourism Partnership North Wales, told BBC Wales the creation of the path had greatly boosted walking as an attraction to the area. She said: "Walking has always been an important part of tourism in north Wales. "You have the Clwydian range, Anglesey, the Llyn Peninsula - all have areas of outstanding natural beauty, and then there's the national parks. "All those are big draws for people coming here for walking or on holiday. 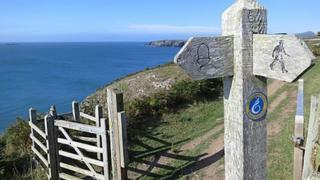 "The coast path has added a new dimension to that and how we can promote north Wales. "It is helping to put Wales on the map, not just for the walking but because it's such a unique thing." The survey, published by Beaufort Research and Cardiff Business School, found average daily spending by people while in the local area (excluding accommodation) was £21.05 per party per day. Those staying overnight spent an average of £57.20 on accommodation. Chris Osborne, a Tenby hotelier who chairs the Wales Tourism Alliance, said the path was boosting business all year round. "The fact you have something that goes right around Wales, I think, is an opportunity for a huge number of businesses," he said. "What is evident too is that people walk throughout the year, regardless almost of the weather." The study identified 5,400 tourism-related businesses within 2km (one-and-a-quarter miles) of the route. It estimated the extra business had led to the creation of the equivalent of 112 jobs by firms along the route, though much of that would be comprised of part-time or temporary work. The researchers concluded: "The Wales Coast Path has added a significant new product to the tourism assets of Wales, and its launch and promotion have raised the profile of Wales and its coastline as well as the path itself." Culture Minister John Griffiths welcomed the report, telling BBC Radio Wales the path had created a lot of interest both in Wales and abroad. "It's a great asset for Wales and demonstrates the value of the path to the economy but also the benefits for people who enjoy the coastline," he said. "A lot of people are using it for its health benefits and we want to continue to improve the path and make it as accessible as possible," he added.